The International Services and Programs department at College of the Canyons here in Santa Clarita (near Six Flags Magic Mountain) is hosting tomorrow’s Welcome Back Picnic for the college’s many international students attending both it’s Valencia campus and Canyon Country campus. The International Services and Programs department has helped, so far, in the 2014-2015 academic year, 270 international students. That is about a 100 more than in the previous academic year of 2013-2014. The department is anticipating more international students next year. College of the Canyons has added many services, activities, and workshops to better serve the entire campus community as well as its growing body of international students. 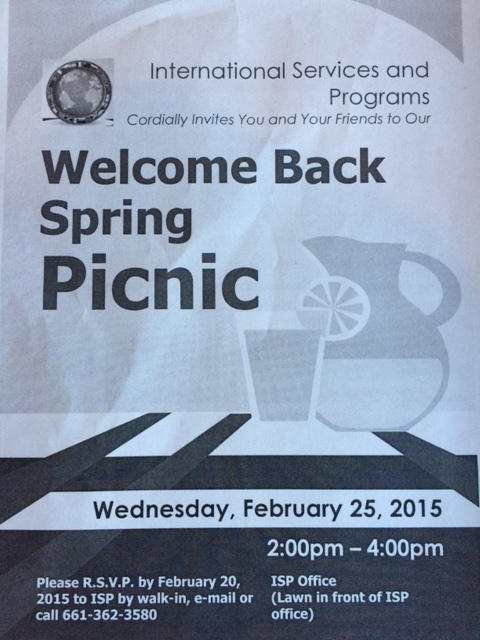 Please feel free to stop by the Welcome Back picnic tomorrow, Wed., February 25, 2015 between 2-4pm at the lawn in front of the International Services Programs office at the Valencia campus.